December is nearly here… eeek! It always sneaks up on me. John 14:27 - I am leaving you with a gift—peace of mind and heart. And the peace I give is a gift the world cannot give. So don’t be troubled or afraid. This sheet is currently hanging in our kitchen, where I can see it throughout the day… which I think will come in handy during the holiday season. Wishing you an advent full of peace, love and above all, JOY, celebrating the good news of our savior’s birth. Sights. Sounds. Tastes. Smells. Feelings. If you’re a person of typical abilities, sensory details like these meld together without discernible beginning or end, making moments textural, memorable and complete. I walked through life for many years this way, absorbing the world and doing my best to process and synthesize it - in music, 35mm film and journals. Many, many journals. But when I became a mom, things changed. Our first child, Elsa, was born with a rare chromosome disorder, and we quickly learned that she wouldn’t be experiencing her environment as we do. Helping her access the things that most of us take for granted became our family vocation, and over time we grew well versed in her sensory likes and dislikes. Touching? Nuh-uh. Not a favorite, although Elsa is generally tolerant of facilitated exploration. Some sensory things bring Elsa great joy. The louder, bigger and more dynamic the experience, the better. But other things - like tasting, and trying to eat orally - bring her stress, agitation and fear. It’s rare to find a picture book that reveals the realities of sensory processing challenges. It’s even more rare to find a book that also celebrates the unique gifts that individuals with special needs contribute to our world. Both are delivered with artistry and heart in HOW TO BUILD A HUG: TEMPLE GRANDIN AND HER AMAZING SQUEEZE MACHINE, a new picture book from the author team Amy Guglielmo and Jacqueline Tourville, and illustrator Giselle Potter (Atheneum, 2018). HOW TO BUILD A HUG is the story of Temple Grandin, an American professor of animal science and autism spokesperson, who invented a “squeeze machine” to simulate something that many of us claim with ease. A hug. When we meet young Temple, the first thing we learn is that she’s a maker… of kites and obstacle courses and sheds. As a parent of a child with special needs, I routinely share Elsa’s diagnosis with new acquaintances to help them better understand her delays. The authors’ choice to ground Temple’s character in her gifts, and not her diagnosis, was really beautiful and inspiring to me. “Is Temple a girl or a boy?” my girls asked. (They are at an age where they look to categorize gender immediately in the books they read.) I shared with them that not all girls look the same, and they said, “OK,” and off we went with the story. I was so grateful for the opportunity to emphasize this truth with them. Many things in Temple’s environment make her uncomfortable - scratchy socks, whistling teakettles, smelly perfumes… and hugs. At school, Temple is bombarded with even more sensory information. The classroom fan whirs like a “dentist’s drill.” The school bell feels “like a woodpecker knocking on her head.” While children may not identify with Temple’s experiences, the creators of this book use sounds and feelings that all readers can relate to in order to build understanding of Temple’s journey. My daughters’ favorite part of HOW TO BUILD A HUG? The scene below, when Temple asks her sister to jump on her, over the couch cushions. My girls LOVE smothering each other and jumping on each other to bond and connect, and really related to this sibling moment. This scene provides a wonderful window into a non-typical family’s life, another gift for the reader. Our own family dynamic certainly has its quirks. We’ll do anything to get a smile out of Elsa, which would probably be unusual for people outside our family to see. It’s the specificity and uniqueness of HOW TO BUILD A HUG’s couch-jumping moment that speaks so honestly about Temple’s relationship with her sister. The couch scene also offers insight into Temple’s intellect and awareness. She asked her sister to jump on her. Temple knew just what she needed, sensory speaking, and requested it, foreshadowing brilliantly to her future discovery. So how does one build a hug? We see Temple conceive it, step by step. While working at her aunt’s ranch in Arizona, Temple learns about a piece of equipment called the “cow squeeze,” which calms skittish cows. The climactic moment of HOW TO BUILD A HUG delivers exactly what the narrative sets out to do: Temple gets her hug, and she makes it with her own hands. This moment is made all the sweeter by a gorgeous illustration that envelopes Temple in all of the things she loves. It's magical and perfectly in-tune with Temple’s character and story arc. Children and adults will walk away from this story with a clear understanding of Temple and her special talents, as well as with empathy for children who face sensory processing obstacles every day. Temple Grandin is an inspiration, and this story honors her and shares her spirit beautifully. HOW TO BUILD A HUG: Temple Grandin and Her Amazing Squeeze Machine is available at or through your local bookstore, or via the online bookseller of your choice. This is the second book from author team Amy Guglielmo (@amyguglielmo) and Jacqueline Tourville (@jatourville), co-creators of POCKET FULL OF COLORS: The Magical World of Mary Blair, Disney Artist Extraordinaire (illustrated by Brigette Barrager). Holiday Book Drive - Here Come the Books! 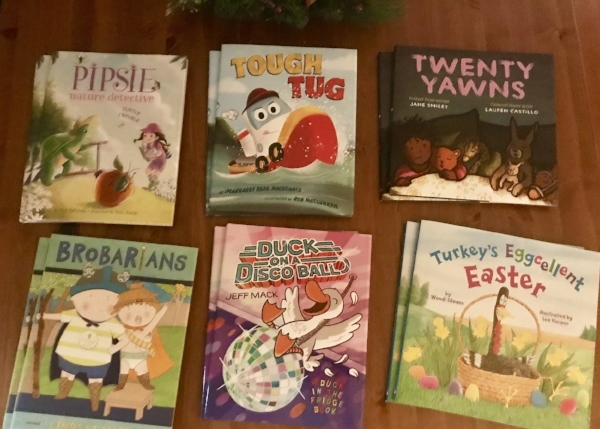 I’m thrilled to share the titles that have arrived so far - a list that I’ll continue to update with your fabulous donations as the holidays near! Thank you young friends in GENEVA, IL, who donated 21 new books to the drive! We’ve also received financial donations, which will go toward the purchase of new books, too! I can’t wait to add more titles to this post! If you’d like to contribute a book (whether you wrote it, or you LOVE it! ), simply message me through the contact form on my blog, found here. For info on what the drive is all about, and all the ways to get involved, visit my kick-off post: Holiday Book Drive 2018 - Ready, Set, Go! One of my favorite things about parenthood is watching my daughters explore objects in their world. They assign meaning and purpose to things in such imaginative, unpredictable ways. Where I see pebbles, they see spirit rocks. Where I see empty bowls and tea cups, they see piping hot pumpkin soup and raspberry tea. Where I see paper, glue and string, they see everything they need to construct a super girl cape. They innovate and create beyond preconceived notions, all the live-long day. This brings them extra close in spirit and practice to Maxine, the main character of new picture book MADE BY MAXINE by Ruth Spiro, illustrated by Holly Hatam (Dial Books for Young Readers, October 2018). In MADE BY MAXINE, resourceful Maxine takes familiar objects and uses them in new, unexpected ways. She de-constructs and re-constructs. She unscrews and re-glues. Her motto? If I can dream it, I can make it. Like Maxine, they hit a few snags. Why-oh-why, Elmer’s glue, why do you dry so slowly?! It is awfully frustrating when the vision in your head doesn’t stick on the maker table. But they tweaked their designs and discovered a new avenue to Ta-Da. While the cousins created, mom learned a valuable lesson: Make sure the hot glue gun is warmed up and at-the-ready! Piling the contents of the recycling bin onto the dining room table is a lot different from taking the lid off a shrink-wrapped game or craft kit. When up-cycling, there are no instructions, no rules. The field is wide open. The girls are already thinking beyond-the-box about their next maker session, and collecting toilet paper rolls... Thank you, Maxine, for taking us into the textural, boundary-free land of making. We like it here! MADE BY MAXINE is available at or through your local bookstore, or via the online bookseller of your choice. Ruth Spiro (@RuthSpiro) is the author of the popular BABY LOVES SCIENCE series. Holly Hatam (@hollyhatam) is the illustrator of DEAR GIRL, by Amy Krouse Rosenthal and Paris Rosenthal, among other children’s book titles. Holiday Book Drive 2018 - Ready, Set, Go! The response to last year’s Holiday Book Drive for Chicago kids simply blew me away. Thanks to your incredible generosity, we delivered more than 400 books to young scholars served by Leading with Literacy, a read-aloud program in Chicago’s Bronzeville neighborhood. That’s why I’m over-the-moon-thrilled to share that the date’s been set for the 2018 (second annual) delivery day: Dec. 12. Yep, mark your calendar for 12/12! That’s when I’ll join Pastor Michael Neal, founder of Leading with Literacy, and my dear friend Chaz Baechler in visiting schools to connect children on Chicago’s South Side with books from YOU. Books, Please! We are excited to receive any book for children. We do ask that the books are new, not used. (The sense of ownership that comes from receiving your own new book is priceless!) Last year, we focused on picture books. But this year, we’re ALSO happily accepting early readers, chapter books and middle grade… woohoo! The Magic Number: Any donation is greatly appreciated - hard-back or paperback, it matters not! But in case you’re wondering: If you have the ability to join forces with a friend (or friends) and donate 30 copies of the same book, you’ll be able to give an entire classroom the SAME book, which is a truly amazing gift. Pssst! Authors… If you think your publisher might be able to provide a complete classroom donation of 30 books, there will be crazy dances happening all over my house and jubilant cheers in a very lucky classroom in the city! Shouting it Out! When your books arrive at my door, I go bananas - it makes me so happy. I celebrate all book donations as they are committed and as I receive them, on social media and on my website, too. Party Time: If you are planning a local (or family) giving initiative this holiday season, consider asking others to pick out and donate a book for a Bronzeville scholar. If you’re interested in organizing something like this, let me know and we can chat logistics. Or… If You’d Rather: Financial donations are most welcome, too. Whatever works best for you. All donations deliver joy! Thanks to those of you who have (already!!!) reached out to ask how to help again this year. That gives me ALL the goose bumps. Can’t wait to see how we work together in Holiday 2018, to give the gift of literacy to even more Chicago scholars! Getting to school is an adventure for all children. No matter where you live, being a student requires special planning, packing and travel to arrive on time for a day of learning. And yet, no two journeys from home to classroom are entirely the same. We’re blessed that Elsa gets picked up from our home. That kicks off the day. Next, I jog behind our middle’s bike to supervise her journey. Once she’s lined up on the playground, I continue looping the neighborhood with the jogger stroller and deliver our youngest to preschool. By the time I’m home, I’m ready for a nap. But coffee does nicely. Our morning adventure feels a bit like “trains, planes and automobiles.” But in reality, all three schools are extremely close, and our routine looks a lot like that of our neighbors and many other kids across America. So our eyes were opened wide by the fantastic new book ADVENTURES TO SCHOOL by Baptiste Paul and Miranda Paul, illustrated by Isabel Muñoz (Little Bee Books, May 2018). In this globe-spanning picture book, readers experience the unique school journeys of 13 children from 13 different countries. ADVENTURES TO SCHOOL takes us into imagined moments in very real places, providing a window into the lives of children around the world. Our family explored ADVENTURES TO SCHOOL with a globe beside us, so we could pinpoint each country featured as we read. But this title is so much more than a geographic jaunt. It’s a portal into the paths of others, which allows us to understand the sacrifices made by children and families across the planet in order to get what many of us claim with ease: an education. Authors Baptiste Paul and Miranda Paul draw us close to distant lands through 13 diary-style stories, written from the viewpoints of children. The accounts are rich in detail and focus on the things that matter most to kids: When they rise, what they eat, who they’re with, and where they land - school. Alongside the book’s storytellers, we sip tea and eat porridge. We cross pathways without shoes. We squeeze into rickshaws. We descend ladders on cliffs. We travel for hours (and in some cases days) until finally we reach school, ready to play and learn. It’s immediately clear that for many children, getting to school is not easy. In fact, in some cases it’s downright dangerous. Baptiste and Miranda’s emotive passages brilliantly balance honestly portraying hardships with conveying a positive, inspiring story. Picture book readers expect that with each turn of the page, something new will be revealed. While ADVENTURES TO SCHOOL doesn’t have a traditional story arc, the page turns are suspenseful. That’s because each story shared is so different from the last. The accounts truly span the globe: Panama, US/Canada, Ethiopia, Nepal, Ukraine, Japan, Bolivia, Pakistan, China, Kenya, Bhutan, Cameroon and El Salvador. Alongside each first-person tale, readers find a sidebar that provides facts about the country presented: its flag, history, topography, animals, climate, city life, and family norms and traditions. The result is a dimensional, textural portrait of each country that pops off the page and plants itself in the mind and heart. Illustrations by Isabel Muñoz are active, vivid and magnetic. Rich reds, earthy browns, expansive blues and touches of gold unite countries in palette, yet each land is still honored as special and distinct. Muñoz’s illustrations provide a variety of vantage points, including a bird’s eye view of Meru and Samburu, Kenya, where children cross over elephant tracks on their path to school. Everything that our family read in ADVENTURES TO SCHOOL was new to us. Everything. While we hope to travel outside the country as a family in the not-too-distant future, we have yet to journey outside the Midwest at this point. But… books take us there instantly. Since reading ADVENTURES TO SCHOOL, we’ve begun thinking of our library card as a passport that provides immediate access to places far from our home. The stories featured in ADVENTURES TO SCHOOL echo a universal truth: Education is worth it. Travel in darkness. Walking for hours. Crossing war zones. While the idea of taking risks for education, as a pathway to a better life, may seem unimaginable to many Americans, it shouldn’t. Each of us has ancestors who did the very same things for us. Whether one generation ago, or 200 years in the past, it is something we all have in common. ADVENTURES TO SCHOOL is available at or through your local bookstore, or via the online bookseller of your choice. Baptiste Paul (@baptistepaul) is the author of The Field and I Am Farmer (written with Miranda Paul, coming in 2019). Miranda Paul (@Miranda_Paul) is the author of many books for children, including Are We Pears Yet, One Plastic Bag, Blobfish Throws a Party and the soon-to-release Mia Moves Out (October 2018). Isabel Muñoz (@isabelmgart) is an illustrator represented by The Bright Agency. For the past few weeks, I've been digging into revision. I love this part of the writing process. The work part. The roll up your sleeves part. Where tough decision are made and gold is unearthed. The story that emerges after diligent, thoughtful revision is always, always, always worth the time and toil. Currently, I'm polishing three picture book manuscripts. Each is completely different and in need of different things. I'm 100 percent committed to making each one sing its song without hitting a sour note. You never want a flat moment to pull a reader out of your story. Everything must be pitch perfect. My toolbox for this latest round of revisions? Fabulous advice received at the August 2018 Grow Your Picture Book Garden workshop in Des Moines, Iowa, organized by SCBWI Iowa. Ahhhh, this event was fantastic! I met so many wonderful kidlit creators, and heard excellent presentations from authors Tammi Sauer, Jill Esbaum and Charlotte Gunnufson, and editor Eliza Berkowitz. 1. Is my character active, relatable, and flawed? Your character needs to be moving and doing things that reveal spirit, charm and uniqueness. And, the mistakes and choices your character make need to be ones that kids will recognize... because they've wrestled with them, too! 2. Is my character fixing a problem that's perfectly suited to him/her? To elicit maximum humor and conflict, the problem faced by your character must be tailored to him/her. Does the challenge make your character super uncomfortable and present opportunities for growth and change? 3. Am I making the most of every page turn? The page turn is built-in drama in picture books (What will happen next??? ), so make the most of it! Pace your drama so that each flip leads to a new, unexpected discovery that moves the story forward. 4. Is every word needed? Picture books today are typically under 500 words, and many are closer to 300. That means every word must count. Cut anything that could be conveyed more powerfully in illustration, and keep sentences active and concise. 5. Is the story full of heart? When children (and adults, too!) crack open a picture book, they do so with the expectation of meeting special characters and feeling something. Be sure that your story makes an impression on the heart. Create moments that are full of emotion, whether funny or touching... or both. 6. Does the title pop? It's just true... books compete for attention. Whether at the book store or at the library, you want your title to stand out, so that more kids get to experience it! Create a title that stands out from the crowd and also conveys your concept in a clear, can't-miss-it, compelling way. 8. Will kids love it? They'd better! Make sure the language and plot are completely geared to kids. Put yourself in the mindset of your reader, then turn up the volume on the silliness, wordplay and drama. 9. What is the story about? When you strip all of the details of your story away, your tale is - at its core - about one thing: Fitting in, being a good friend, solving a problem, finding your true talent. This is something that you need to know and be able to express to any and everyone. 10. What universal emotion does your story deliver? Sometimes I think of emotion in terms of color. What is the primary emotional color is your story? Does it vary in hue and tone? Consistency of emotional experience - inclusive of moments that intensify, then soften - ensures a journey that feels complete, cohesive and satisfying. Creators, I hope these questions lead to discoveries during revision that bring your manuscript to the next level, and give it the best chance of connecting with editors and getting into the hands of kids everywhere! When you think of cute animals, what tops your list? Kittens and puppies get all the love. What about axolotls, huh? CUTE AS AN AXOLOTL (which releases Aug. 28) is the third book in Keating's "The World of Weird Animals" series. When writing these surprising, exciting animal books, Keating combs the planet for creatures of a certain theme. Our family was wowed by the first two - Pink is for Blobfish and What Makes a Monster? - and eagerly awaits axolotl and all its cute counterparts, which are surely more than a sweet face. Is there anything cuter than an axolotl? My goodness, adorable! Have you always had a soft spot in your heart for this sweet amphibian? Aren’t they so sweet? Yes, I have always loved axolotls. They are a perfect example of an unassuming creature with superpowers! I have a soft spot for any animal that can surprise us with its abilities, which is why I am endlessly fascinated with pretty much every animal out there. Axolotls are particularly amazing because behind that adorable face, they are able to regenerate body parts. But not just tails or legs like some creatures you may know about: they can also regenerate parts of their brains! It’s incredible. How do you go about match-making extraordinary animals into different themes when you plan your books? This is a great question! It’s also the element of these books that takes up the most time: the theme and animals I pick really need to work together perfectly, but also in a unique way that I haven’t seen before. When I started this series, I knew I wanted the books to be about more than animals. I wanted them to be mirrors of our own judgments and attitudes about animals and ourselves. With Pink is for Blobfish, I wanted to explore our gender expectations behind color, so I knew I would have to showcase a wide variety of animals to allow kids the breathing room to explore various “traits of pink.” In What Makes a Monster?, my goal was to get them thinking about difference, and where we draw the line between scary and unique. Cute as an Axolotl tackles our judgments about appearance, but this time, we’re looking into appealing traits and exploring how we limit those creatures by boxing them into a “cute” category. They’re so much more than a cute face! Because I want readers to see the astonishing variety out there, I chose animals that, collectively, embody the picture I see when I look at the world of cute. If I do my job on these books, kids will have enough examples to recognize a little bit of themselves in some of these creatures. We all contain multitudes! You give so much encouragement to writers, from advice and perspective to vibrant original artwork. (So many talents!) Where do you turn for inspiration, on the web and - perhaps most importantly - far, far from it? Thank you! I hope that readers and friends online are encouraged by my posts. Life is too short to not chase after what inspires you, so I make a point to tweet out daily pep talks. After years of practice, I find inspiration everywhere, and I’ve learned that the secret is to not judge where my curiosity wants to take me. I follow hundreds of scientists and science journals online, which keeps my head full of the latest developments out there. But most of my book ideas don’t start from the science. Instead, they come from quiet time and following my interests, especially out in nature or exploring some new art practice. Without quiet, it’s hard to hear your inner voice (or call it curiosity! ), so I make time everyday to intentionally listen to what’s bubbling under the surface of my ideas. I believe creativity comes when we mix all of our favorite things together, so don’t hesitate to learn about anything that strikes you! You never know what connections and ideas will come from it. The pleasure is truly all mine, Jess! CUTE AS AN AXOLOTL (Knopf Books for Young Readers) is available at or through your local bookstore, or via the online bookseller of your choice, starting Aug. 28. You can learn more about Keating, author of numerous books for children at jesskeating.com. Titles by Keating include the "My Life is a Zoo" series (How to Outrun a Crocodile When Your Shoes are Untied, How to Outswim a Shark Without a Snorkel, and How to Outfox Your Friends When You Don't Have a Clue), "The World of Weird Animals" series (Pink is for Blobfish, What Makes a Monster?, and Cute as an Axolotl) and the picture book Shark Lady. Connect with Jess on Twitter at @Jess_Keating. The pool has never been my daughter Elsa's happy place. The glare of the sun, the shock of the cold water, the numerous sunscreen-in-the-eye mishaps… In an environment where most kids find endless fun, Elsa simply hasn't been able to get comfortable. Therapy pool classes have always been a positive experience for Elsa. Who wouldn’t love swimming with a one-on-one buddy in a quiet 90 degree pool? But this has never translated into outdoor swimming success... until this year. In January 2018, Elsa joined a pool group at a nearby rehab hospital with the goal of giving us ways to cope with and enjoy the pool. At the beginning of the class, Elsa was tolerant, but nervous. Her floatation ring, designed to keep her head afloat, was worrisome to her, and she was hesitant to walk across the pool deck. 3. Puddlejumpers. I never, ever imagined that Elsa would be able to use Puddlejumpers, but once she mastered the floatation ring, the next step was wearing what her sisters wear. Seeing Elsa in a Puddlejumper has enabled me to view her potential in the water in a new sky's-the-limit way. She loves being able to lean back and float. It requires complete hands-on assistance, but she's figuring it out, and loving it. Once she felt safe doing that, her therapist worked with her on getting her face down and humming into the water. Now she is blowing bubbles! I'm telling you, I cannot believe it. Is this video not the coolest? In addition to these things, we also have a half dozen moves that we can do in the pool with Elsa - ways to handle her and swim with her to give her sensory input (jumping, rocking, singing, swaying). So, we're in a great place! We've enjoyed the pool all summer without incident and, truly, with joy. A special treat: Click HERE to watch the WHS Summer Slideshow, a video of 25 kiddos with Wolf-Hirschhorn Syndrome enjoying the season (including Elsa). You'll love it!